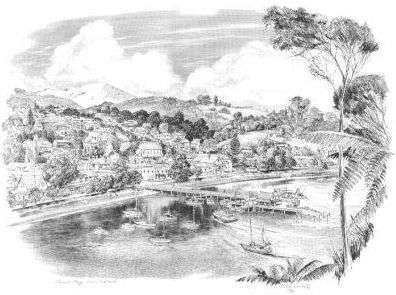 From the early 1800s, South Sea whalers found Kororareka ideal as a provisioning port. The town grew in response, gaining a reputation as a lawless and bawdy port, and earning the nickname Hellhole of the Pacific. 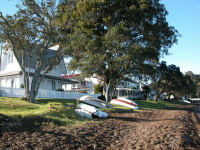 The image has changed but Russell is still a provisioning base for pleasure craft cruising the Bay of Islands and the South Pacific. 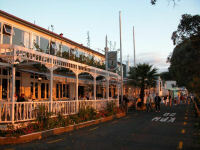 One of the surviving witnesses is Russell’s historic restaurant The Gables, built in 1847. 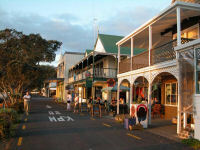 The town continued to expand until the country’s first Capital at Okiato (formerly Old Russell) moved to Auckland. 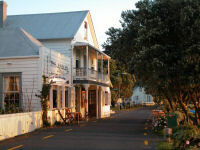 Kororareka and the Bay of Islands began to decline economically as a result. This was hastened by the sacking of the town in 1845 by the forces of Hone Heke and Kawiti, two powerful Maori chiefs. Following the sacking, Kororareka, now renamed Russell, was gradually rebuilt finding its main source of income in the provisioning and refitting of whaling ships. Later manganese mining, fish canning and coal brought quiet prosperity to the area. From the early 1900s Russell became known as a quiet historic town. Other attractions that brought visitors were the annual regatta and the development of big gamefishing, promoted with enthusiasm by the American writer, Zane Grey. Today, tourism, fishing, oyster farming and cottage industries provide much of the employment for its population of 1000 people.